Servoframe "Type 11 B Bearing" with integrated counter bearing. The frame is thin as the servo. 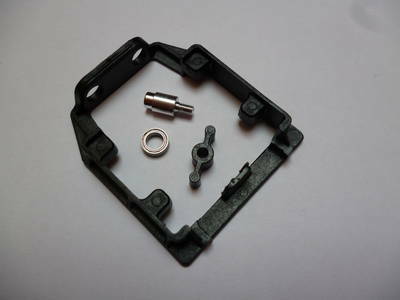 Due to the innovative design, the servo can be installed without screws. The screw of the servo output shaft is replaced by an aluminium part. So you need no tools for removal and installation of the servo. The frame is fixed in the wing with epoxy. The frame can be used for left or right side equally.